By the time kids figure out the age of mammals was distinct and separate from the age of reptiles they have also had impressed upon them that the two ages were very distinct climatically as well. The time of the dinosaur is portrayed as a time of perpetual "hothouse" conditions- with greenhouse tropical climes extending pole to pole. And after the dinosaurs the earth plunged into ice age conditions where emblematic shaggy fossil mammals such as the woolly mammoth tromped across glacier landscapes. But the reality of the situation is far more complex. A growing body of evidence is mounting that suggests that the climate throughout the Mesozoic was not always as hot as was once assumed. The famous "Jehol biota" of Liaoning, northeastern China is now thought to be representative of an early Cretaceous global cooldown. Famous for its diverse assemblage of fuzzy small theropods/early birds- the site made headlines earlier this year with the discovery of the first truly large feathered theropod, the tyrannosaur Yutyrannus huali. If you would like to read further on temperate Liaoning here is an excellent summary on this fascinating ecosystem of fuzzy dinos, dino eating mammals, and inland seas. The idea of the age mammals being a cold one is so enmeshed in most people's minds that the average person would be hard pressed to name a prehistoric mammal that is not an ice age mammal. Polar forests were quite extensive. Fossils and even preserved remains of trees such as swamp cypress and dawn redwood from the Eocene have been found on Ellesmere Island in the Arctic. The preserved remains are not fossils, but actual pieces preserved in oxygen-poor water in the forests of the time and then buried before they had the chance to decompose. Even at that time, Ellesmere Island was only a few degrees in latitude further south than it is today. Fossils of subtropical and even tropical trees and plants from the Eocene have also been found in Greenland and Alaska. Tropical rainforests grew as far north as northern North America and Europe. 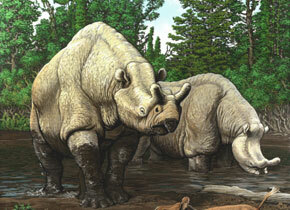 The Eocene lasted about 20 million years. In contrast the Quaternary, the period of glaciation known as the ice ages, has only been going for about 2.6 million years. One can make a case that not only is the Cenozoic not characterized by glaciations- but that these conditions are in fact the exception not the rule.